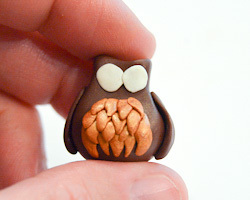 This little polymer clay owl is easy to make with these step by step instructions. 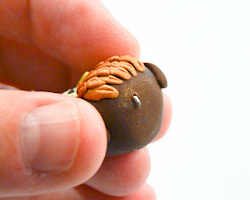 If you haven't worked with polymer clay before, it is really fun and there is so much you can make with it. 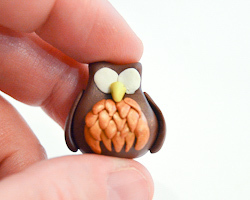 My children, ages 5 and 9, also made these polymer clay owls right along side me. 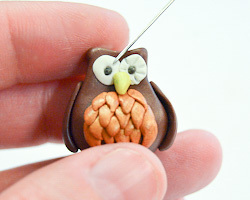 If you would like to learn more tips about working with polymer clay, please visit my Working with Polymer Clay article. 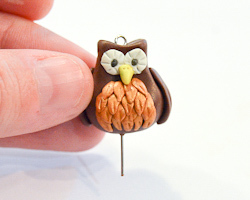 I decided to make this little owl into a pendant, so you can add on a chain or cording of your choice. I made another owl slightly bigger and baked him on a toothpick, and have him sitting in my potted plant right on my kitchen window sill above my sink. I love seeing him peer out at me! 1. 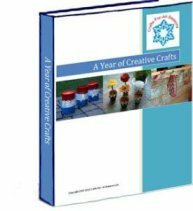 Begin by conditioning all the polymer clay you will be using. 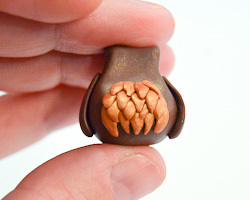 This is a tiny owl, so you will not need much clay. 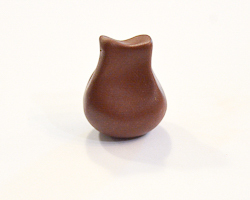 You will need about a 3/4 inch ball of clay for the owl's body. 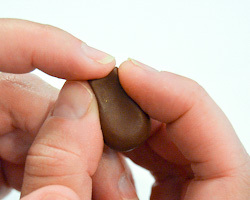 From this main color (I chose brown) pinch off two pieces to create two smaller balls the same size. These will be the wings of the owl. Pick a secondary color for the owl's feathers on its breast. You will only need a pinch of white, yellow, and black. 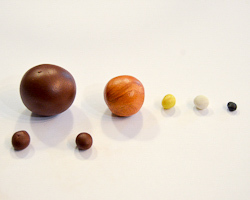 Take a look at the size of the polymer clay balls below for reference. (I ended up having way too much gold clay, you will not need as much as shown here). 2. 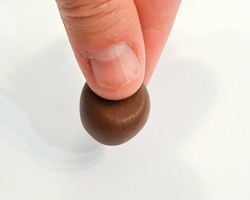 Take the ball of brown clay, and pinch the top of the ball to flatten it just slightly. 3. 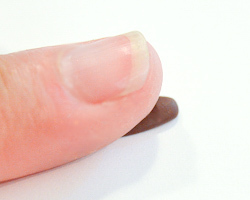 Put your two fingers along either side of the flattened area, holding it in place, while you squish down the top of the flattened ball with your finger. You are created the owl's head. Use the pictures below as a guideline. 4. 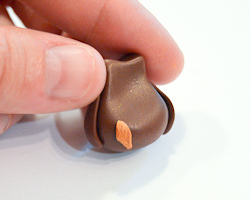 To create the wings: Take the two small brown clay balls and roll them into a little log. 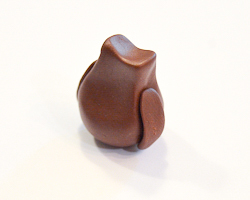 Flatten them just slightly with your finger, then add them to the side of the owl to become the wings, as shown. 5. 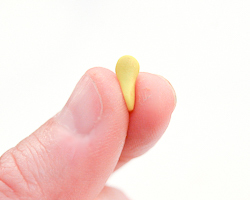 To create the breast feathers: Begin pinching off tiny pieces of gold clay. 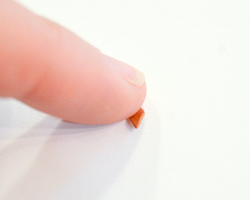 Roll these tiny pieces in a log, then press it down with the pad of your finger, until you create a little feather shape, as shown. 6. Beginning at the bottom layer, begin to add on the little feathers to the breast area, one by one. Have each row slightly overlap each other, as shown. 7. Next, flatten two tiny balls of white clay to form two circles, of equal size. Apply them to the face to become the eyes. 8. 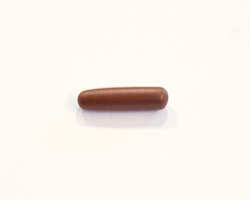 Make a little beak by rolling a small tube of yellow clay and pinching the end to make it sharp. You want to create a little triangle shape. Add the little beak right below the eyes. 9. Using a pin, or the end of a sharpened pencil, make two holes in the center of the eye whites (Here I am using a polymer clay tool that has a pointed end). 10. 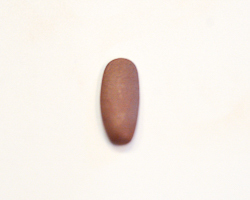 Roll two very tiny specks of black clay between your fingers, to become the beady little eyes. 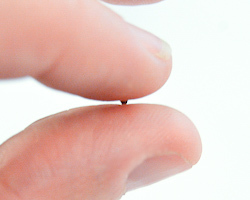 See how small the ball of clay is? You can barely see it between my fingers. Carefully pop these little bead eyes into the holes you just created in the white eyes. 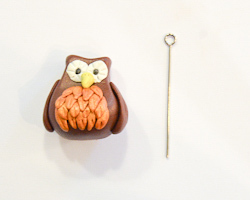 Now, use a pin to add some texture to your owl. Here you can see I'm using the end of the pin to create little lines on the whites of the eyes. 11. I also used the pin to add a line to each breast feather, two holes in the beak, and some lines of the wings. 12. 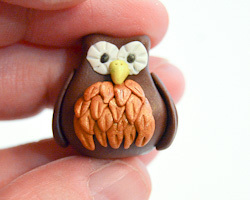 To make this little owl into a pendant, you will need an eye pin that is a little longer than your owl. 13. 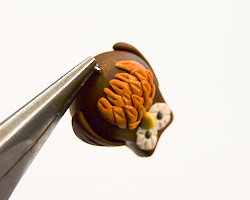 Pierce the eye pin right through the top of the owl's head and push it all the way through, until the top loop is flush with the head. 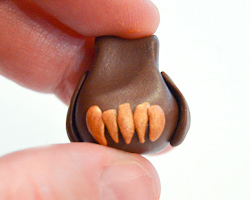 Bake the polymer clay owl in the oven according to the polymer clay package instructions, and allow to cool. 14. Clip off the excess pin coming out the bottom of the owl with jewelry wire cutters, and bend the remaining wire flush against the owl's body. 15. 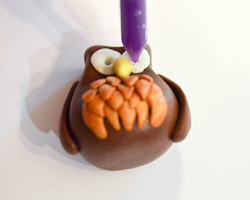 You can now coat the polymer clay owl with a protective acrylic spray if you like. 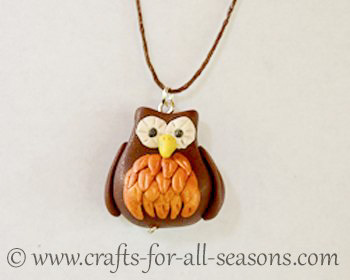 Add on a jump ring and a chain or cord of your choosing and your polymer clay pendant is ready to wear!